Recipe by Lori Lange, author of Recipe Girl. Preheat the oven to 400 F. Line a large baking sheet with foil or parchment paper. Lay out the 6 tortillas on a flat surface. Divide the mashed potatoes evenly between the 6 tortillas. Spread the tortillas with the potatoes – just in the center of each tortilla. Add about 1/3 cup of chicken on top of each tortilla, then sprinkle with cheese. Fold up the sides of each tortilla and roll over to tightly enclose each one in a burrito shape. Place each burrito seam – side – down on the prepared baking sheet. Spray the burritos lightly with nonstick spray and bake for 15 minutes. Serve with desired toppings – sour cream, salsa and guacamole are recommended. 1 Preheat the oven to 400 F. Line a large baking sheet with foil or parchment paper. 2 Lay out the 6 tortillas on a flat surface. 3 Divide the mashed potatoes evenly between the 6 tortillas. Spread the tortillas with the potatoes – just in the center of each tortilla. Add about 1/3 cup of chicken on top of each tortilla, then sprinkle with cheese. 4 Fold up the sides of each tortilla and roll over to tightly enclose each one in a burrito shape. 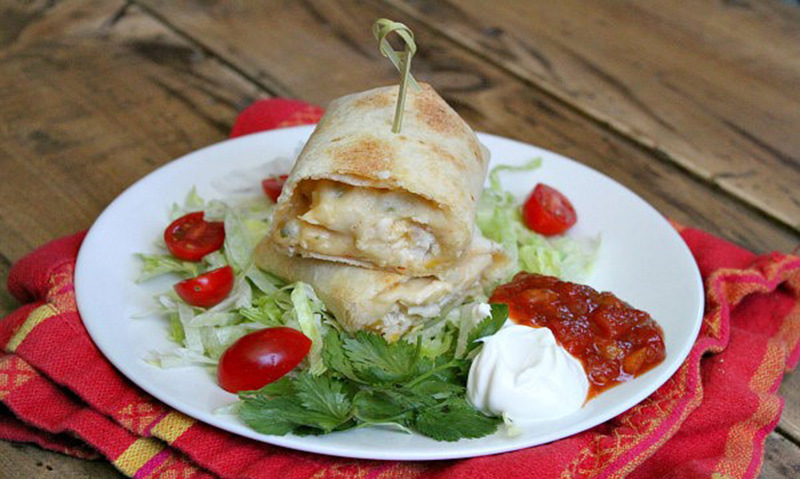 Place each burrito seam – side – down on the prepared baking sheet. Spray the burritos lightly with nonstick spray and bake for 15 minutes. 5 Serve with desired toppings – sour cream, salsa and guacamole are recommended.